Too young to fight for the sea? Not in Albania! Coordinating a large project at a national level is not easy. Despite her young age though, Marinela Mitro handles the task with passion and the support of a talented and committed team. 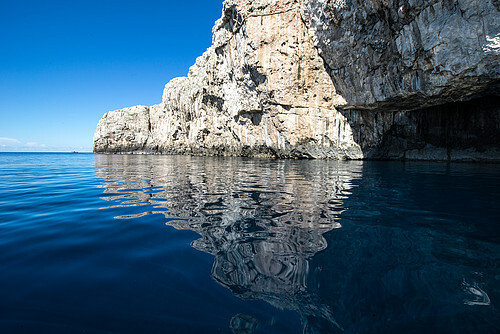 The mysterious Karaburun Marine Protected Area in Albania could not be in better hands. 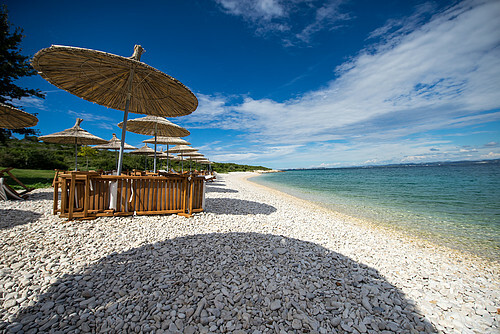 What do you remember about this coastal area as you grew up in nearby Vlora? Well, it’s actually quite intriguing… As a kid, I used to ask my parents very often about Karaburun Peninsula and Sazani Island, lying just in front of Vlora, my city. I was curious to know why they weren’t accessible to people, what was their history and what nature looked like over there. You see, the fact is that they have been military bases for more than 70 years. 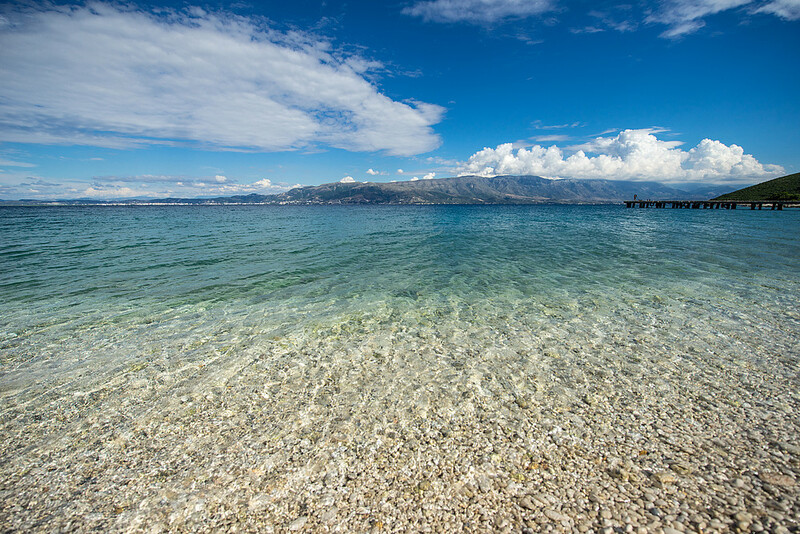 During Communism, Sazani island had a small village populated by army families, while the peninsula still operates as one of the most important marine military bases in Albania. This is why, in that period, access to the area was forbidden to all Albanian citizens. Little did I know that thanks to this project I would become the kid with a story to tell about these amazing sites! How did you start your journey in the nature conservancy field and later come into contact with WWF? So, those childhood memories I mentioned were part of my overall fascination with nature, wildlife, geography and especially marine habitats. Because of the limited opportunities to access such places directly, or even just get information about them, I chose to go to university and study for a Masters degree in Environmental Biology. 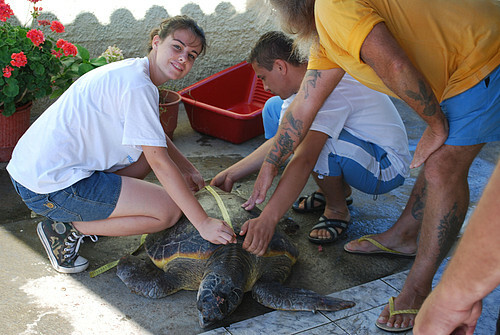 During those years, I took part in various wildlife projects such as volunteering in Greece on marine turtles, a truly amazing and useful experience. And it is in that very same study period that I encountered WWF's logo for the first time! Then, after getting my degree, I started volunteering at INCA (Institute for Nature Conservation in Albania), one of the most important environmental NGOs in my country. 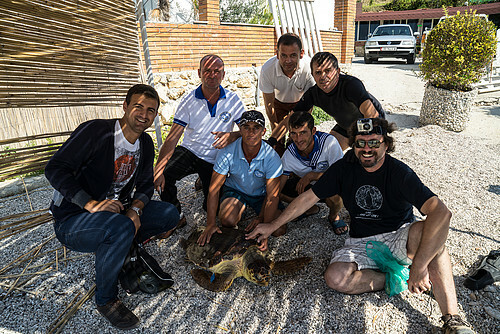 Several months of volunteering and assisting with its projects, combined with my passion for nature and love for my hometown, convinced INCA that I was ready to join my colleagues in coordinating the SEA-Med project and so becoming part of this WWF initiative. A dream came true! What are your role and main activities, in connection with this MPA? First off, let me tell you about the SEA-Med Project in Albania, which I coordinate on a national level. 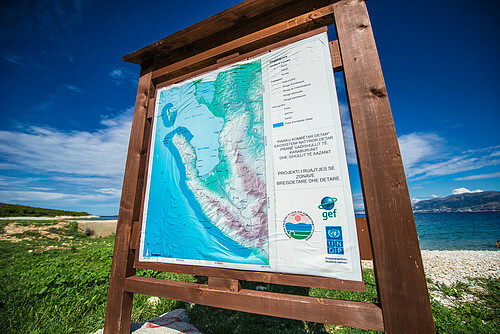 It focuses on the Karaburun-Sazan MPA and its 4 main objectives are designing a sustainable tourism management plan for the protected area, promoting the site as a new tourist destination, establishing ecotourism activities inside it and last but not least, educating and empowering various groups with an interest in the area. I am responsible for the overall project implementation, facilitating communication between actors, monitoring experts, leading and organizing working groups and communicating with donors. In the near future I will also facilitate the development of new partnerships between institutions, NGOs and operators working in our MPA, as well as new collaboration with existing partners to ensure long-term results and continuous monitoring in the area. By working closely with the locals I have learned a lot not just about our wonderful natural heritage but also about the people themselves: their way of living, their attitudes and the challenges they face. This is why the SEA-Med project is not just a work assignment: for me it’s an opportunity to explore nature, know my people and guide them toward sustainable prosperity. I deeply love this area and want to keep working in it, and for it, in the future. How has being so young been a challenge and an asset in delivering results? To tell you the truth, in principle being young is not a challenge at all! Indeed I started working on this project when I was 24 years old - which means that I still had to build experience in coordinating projects. Thanks to the professional support of my colleagues at the beginning and by getting familiar with partners over time, I understood that doing your best is truly what counts the most. This is why I consider being young, full of energy and with an undying wish to protect this area and make the world a better place, to be my greatest assets. What’s more, other young people that work in different institutions related to the MPA are participating in the project planning team: so this is a great opportunity for us to exchange and brainstorm innovative ideas. Which sustainable fishing and tourism activities are already in place or are you planning on establishing? Since 2012, so only over the last three years, various tourist activities like tour boats, hiking and diving, have started up around the site. Tour boats along the bay were not allowed before because of a government boat moratorium that finally ended 5 years ago. Some operators offer diving through promotion in hotels and restaurants since there are no diving centers in the bay, and this activity is not yet regulated by law. Hiking is also offered by hotels as foreign tourists are very interested in it. 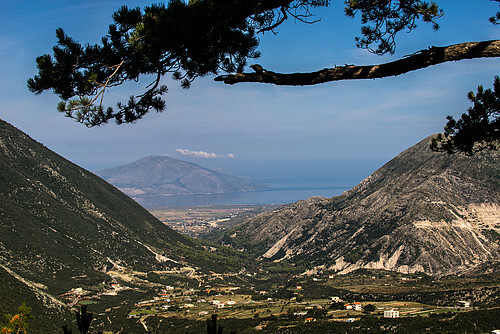 The surrounding area does offer very interesting and beautiful itineraries! 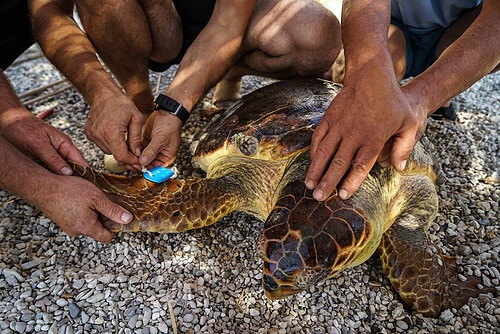 Recently INCA, through the SEA-Med project and UNDP, has set up a few simple infrastructures on the site to help nature conservation and facilitate ecotourism activities inside the MPA. So tourist facilities have been increasing and diversifying in recent years as a result of continuing collaboration with the government, NGOs and operators, but much remains to be done. 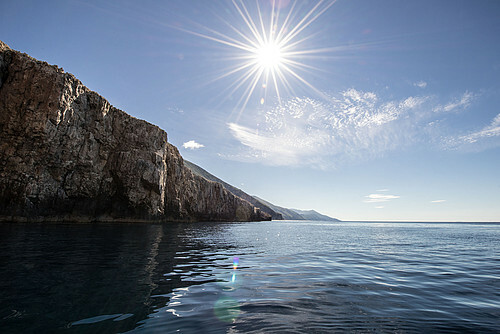 What impact is this summer’s opening of Sazan Island to tourism having on the MPA and how are you preparing for it? Sazani’s opening to tourism this year for the first time ever is an important step forward. People can finally explore its natural riches and old military settlements. To this end, we have included the island in guides and information material prepared for this summer. This happy event is made possible by the National Agency of the Seacoast with the support of Conservatoire du Littoral, INCA (through the SEA-Med project) and other institutions. We are all very excited! What have been your greatest satisfactions in working with this MPA? Organizing familiarization tours for journalists on site, implementing professional infrastructures for operators and consulting with interest groups on the process for the development of the Karaburun-Sazan MPA Management Plan, were all important moments that made my work worthwhile! I would say though that what I have found most rewarding has been informing tourists and other groups on the existence of the MPA by means of a communication strategy. As part of it, each summer we organize simple communication campaigns and produce paper placemats for restaurants with information about the site. One evening, when I went by chance to a simple restaurant near Orikum, the waiter brought these paper placemats and then started informing us of the nearby MPA, recommending a visit to Karaburun as a very interesting destination. It was amazing to hear that from a young guy! What would you recommend to any other young person who may wish to follow your path? I am glad that in recent years a lot of young people have become enthusiastic about nature and have a positive approach towards it. They are more aware of the environment and most of them have some basic concepts of sustainability too. Nowadays teens and students are more likely to practice nature-based sports and get in touch with wild nature through camping, hiking, trekking and looking for new destinations. I’m so happy to have followed my passions and feel lucky to have a career connected to them. 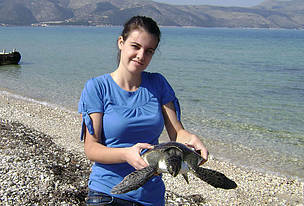 While job opportunities in Albania are limited, I still tell all young people who love nature to follow their dreams. But even if you become a doctor, economist or teacher, for instance, you can still be a nature lover and find other ways to be close to it. For instance by visiting our lovely MPA!